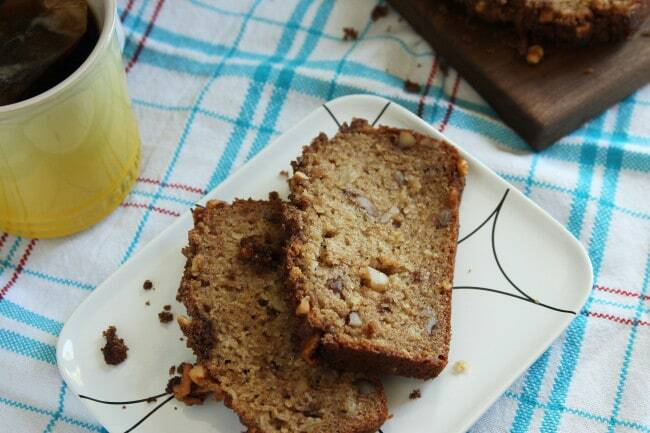 Applesauce Bread is moist and slightly sweet with a walnut and brown sugar topping to put it over the edge. This is the perfect afternoon snack or early morning treat. This post is sponsored by Diamond of California, but all opinions are my own. Thank you for supporting brands that help make this site possible. Sometimes, during the summer, I start wishing for fall. Up until recently, I did not have to wish so much here in Chicago – the weather was uncharacteristically cool. In the past couple of weeks, however, the temperatures have been pretty standard for the end of July – meaning not just hot, but also smotheringly humid. Someone get me a snorkel, I feel like I’m drowning. At any rate, I now find myself wishing for cooler temperatures again. Nothing drastic – just cool enough to casually throw on a cute scarf with my outfit and actually look put together again, or to bake a loaf of bread to enjoy with a mug of tea and a good book on my imaginary front porch. That’s my kind of weather, right there. 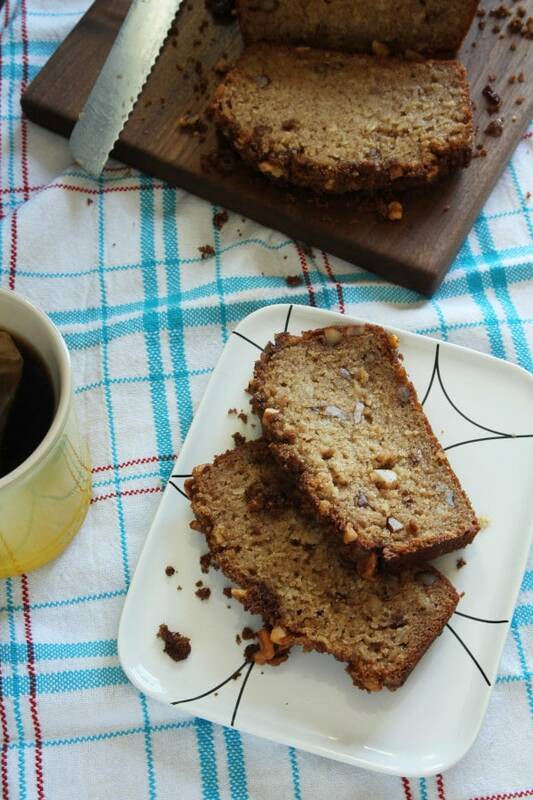 And when fall appears, this Applesauce Bread is the first recipe that is going to be on my bucket list to make. 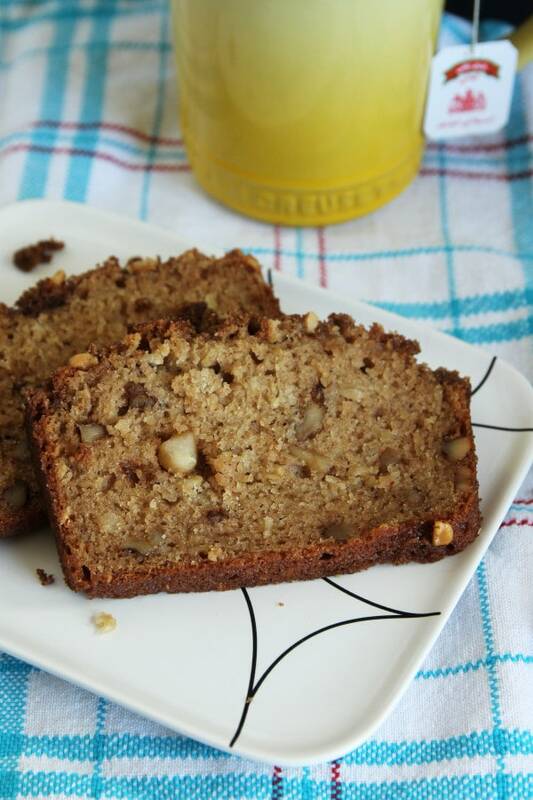 Have you ever wondered what would happen if you made banana bread with applesauce instead of bananas? Delicious things, that’s what. 1. I added 1/2 cup of oats to the batter and swapped coconut oil for vegetable oil. Not because I thought I could market this loaf as “healthy” if I did so, but because they both boost the flavor of the bread in their own way, without either one overpowering the flavors of the applesauce or the nuts in the batter. 2. I effectively balanced out any potential health benefits of #1 by increasing the amount of sugar-and-nut topping on the bread. Because crumbly brown sugar and nuts – use walnuts or pecans, whichever you prefer – on top of Applesauce Bread is pretty much a dream come true in my book. Once the heat breaks, go forth and bake, my darlings. You’ll be glad you did. Preheat oven to 350 degrees. Grease a 9x5-inch loaf pan. Set aside. In a large bowl or measuring cup, whisk together the coconut oil, applesauce, milk, eggs and granulated sugar. In a large bowl, whisk together the flour, oats, baking powder, baking soda and spices. Add the wet ingredients and the chopped walnuts or pecans and stir to combine. Pour the batter into the prepared loaf pan. In a small bowl, stir together the topping ingredients until well combined. Sprinkle evenly over the bread batter. Bake for 50-60 minutes, or until a toothpick inserted into the center of the loaf comes out clean. Allow to cool for 10-15 minutes in the pan before removing and allowing to cool completely on a wire rack. Wrap tightly in foil and store at room temperature for up to 3 days. It’s been too long since I’ve made this bread. Must make it for us. This looks delicious! Love how this bread is centered around the applesauce and love the chopped nuts in there for texture! I don’t think there are enough applesauce-centered recipes. Let’s change that! I’m already dreaming about fall baking. Nothing beats the smell of fall spices. Can’t wait to try this bread! Fall baking is just the best! I 100% support all of your tweaks to this recipe-it looks fantastic! And your front porch isn’t imaginary anymore!! It’s even screened in, so no bugs!!! Woohoo!! I’ll be on my way next spring. just put in the oven…can’t wait to see how the bread comes out!! so far I rate it a 5 star! it is so easy to put ingredients together…no mess! Love that! I’m so glad, Diane! I hope you loved it.